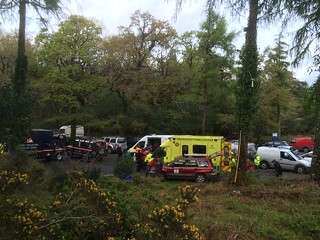 On the 9th of May AREN took part in a multi-agency mass casualty exercise hosted by Kerry Mountain rescue in Killarney. Other agencies involved included An Garda Síochána, the HSE, The Irish Coast Guard, The Civil Defence, The Search and Rescue Dog Association, Irish Search Dogs, Killarney Water Rescue and others. The AREN station was set up in the on-site co-ordination centre alongside the Inter-Agency Mobile Command Unit. Net Control was in West Cork with two sub-stations operating in County Waterford. 40m voice and Winlink data was used to get traffic out of the mountains to the outlying substations who forwarded messages to recipients by normal means. Participating members were Eoghan EI5HBB, Martin EI2HIB, Tim EI2KA John EI7IG and Conor EI4JN. Posted in 2015, activities, national, training | Comments Off on Killarney multi-agency exercise. The final update was received today from Jayu VU2JAU who has been keeping in daily contact with Satish 9N1AA on 20m. Their scheduled contacts have decreased in frequency over the last few days and closed at 02:30UTC today. This is the last known formal international link to stop operating following the ending of MARS communications support at 1100z 05 May 15 between T6TM in Afghanistan and Dr. Panday, 9N1SP. Aftershocks continue in the area but the frequency of those events has reduced quicker than expected, however there are still vulnerable structures which are being worked on and the terrain means landslides remain a possibility. There are still Radio Amateurs in the country for example Dale, BA4TB and Mi, BD4TR are part of the Chinese rescue team assisting in the aftermath of the earthquake. Their activity though is in their spare time on the HF bands and is being well advertised through the Dx lists. Thanks to everyone for their patience and support during the radio amateur activities associated with this disaster. Individual organisations are now commencing their Debriefing process to see what can be done to improve the response next time. Radio Amateurs continue to provide communications services in the aftermath of the earthquake in Nepal. While the pace of communications has slowed the international links which have functioned since the first hours of the disaster are still working though on a reduced schedule. The ARSI Co-Ordinator for Disaster Communications in India VU2JAU praised operators Paddy VU2PEP, Sarath VU2SCV, Sanil VU3SIO, Dorrai VU2DVG, Tapas operating VU2IWA and Walidbhai A41LD for the time given for this operation and supporting him through into the night. He is now maintaining a schedule with 9N1AA every two hours should the needs change. The Nepal – American link supported by the the MARS organisation in America with Ajay 9N1AJ providing the Nepal end of the link reported on 5th May. It is expected though that this link will reduce to a periodic schedule to keep the lines of communication open. Within the country a repeater donated by CAN-USA which had been held up at customs is now reported by 9N1SP as released and now at Kathmandu University ready for deployment. While sad that this repeater was held up when it could have been useful with the current disaster, Nepal suffers a monsoon season starting in June and it is hoped that it will help the preparedness for future events. An announcement is expected today ( Sunday ) of the official end of the international Urban Search and Rescue (USAR) phase with the expectation that USAR teams will start leaving the area shortly. It is however still the case that in rural areas it is taking 5-6 days to reach those areas to try and provide assistance. Two Amateur Radio stations have started operating from some of those rural places. 9N3AA Jose operating from Damauli, District Gorakha and 9N1SD Akarshan installed at Sindhupalchowk. Both the areas are highly devastated and affected. VU2JAU reported that all amateurs in India are coordinating well, he also makes special mention of A41LD Walid bhai who has supported them right from the first day. Nepal previously depended heavily on mobile phones for communications (64% according to Wikipedia) and while restoring supplies to cellphonesites can be prioritised, power supplies for the citizens remain difficult. A requirement for 500 crank chargers was identified immediately which was passed on to all Indian Radio Amateurs who hope to be able to ship some crank chargers soon. Many countries radio amateurs remain active in the area as the communications needs have not gone away. Teams certainly remain from India and China with some emergency traffic also heard in what was believed to be Russian on 14.300 on Friday. Operations are taking place on a number of frequencies in the 40, 20 and 15m bands with 9N1SP specifically maintaining an international link on sked with the American MARS organisation. frequencies. If you hear the words ‘Emergency’ please give the stations room to work. IARU Region 1 Emergency Communications Co-Ordinator. The death toll in Nepal is now over 6,600 persons with a further 100 believed to have died in neighbouring India, Tibet and Bangladesh. The roads to the highly affected areas are closed and the rescue teams are also facing problem to reach on the spot to help people. They all are expecting the roads to open in due course. Satish 9N1AA is supposed to go to Langtang area to join the rescue team to locate people now that his operations on 20m have closed. Sandip Baruha VU2MUE set up an APRS station in New Delhi and also connected one Italian APRS station in Nepal and exchanged massages. It is hoped to get more information regarding APRS from Sandip soon. Additional Nepal licenses are now believed to be issued with 2 new callsigns issued 9N3AA, to OM Jose and 9N3RT to OM Ravinder. There are another 4 9N1 stations are in operation from different places. VU HAMs are continuously watching the operation from early morning to midnight and sometime after that also. We are thankful to get cooperation from VU2PEP VU2SCV, VU3TAH, VU3SIO, VU2BL, VU2DVG, VU3PUA, VU3SXN and myself VU2JAU. Chinese Radio Amateurs as part of a relief team are now established Tinchuli,Boudha,Kathmandu on generator power. They hope to get their 9N7 callsign from the Ministry of communication on Sunday. People are still looking to get their mobiles to charge so 100 mobile chargers landed there. 30 mobile chargers given in Sakal area, 50 given in Sindhupal chowk and remaining will be distributed in other areas. Within the Amateur Radio community there is a greater interest in the emergency aspect of the hobby and anyone interested in finding out more should contact their National Co-Ordinators. In Region 1 their details are available here. In all disasters there is a sad shift from search and rescue activities to one of recovery. In Nepal this transition is beginning with no further Search and Rescue or Medical teams being required to enter the country and those who are in already reaching the end of their normal planned 10 day period in the area. The situation in Nepal remains difficult but as international resources have been deployed, such as extra equipment from the ITU and the power situation in the country improving then the telecommunications needs change. An example of this is the closure of the nets on 20m which had been focused on Kathmandu Radio Amateur Satish Kharel 9N1AA today. The situation having improved enough for him to have been interviewed in TV in the USA via a Skype Link ( Video available here ). Other radio amateurs from India, China and Turkey amongst other countries remain in Nepal until their deployments end and the public communications systems are improving with efforts by the Nepal Police and other agencies to deploy solar chargers so the public can start using their mobile phones again. The Nepalese authorities are reported to be offering licenses to visiting Radio Amateurs but they are taking a little time to process and the operators are given a specific Nepal callsign and are not allowed to use their home callsigns. Dr Sanjeeb Panday 9N1SP has also been operating throughout the emergency following the protocols set in previous exercises with the MARS organisation in the Unites States and these operations have included the use of SSTV to pass pictures back to the US to assist the disaster response. Dr Panday’s operations continue to the best of our knowledge. This disaster has generated a large amount of positive publicity for amateur radio externally and hopefully interested more Radio Amateurs in preparedness and participation in Emergency Communications Programmes. The IARU Emergency Centre of Activity Frequencies have also been extensively used which is another positive feature.